﻿ What does it mean? Take a look around the Science Centre and see if you can find some words by the famous scientist Albert Einstein. Scientists are people who ask questions. They watch and listen. They set up experiments to test ideas. They get answers. They ask more questions. It's a straightforward, although not always easy, method that a child can understand. In fact it's how young children learn about the world. Kids are natural scientists. Adults have been learning how the world works by asking questions and testing ideas - by doing science - for around 450 years. Before that pure thought or God were the main sources of information. By now the scientists are pretty good at asking questions and figuring out how to get answers. That's mostly what they learn at school and university. It's mostly what you'll learn if you decide to become a scientist. But there's something else that scientists don't usually learn on their physics, chemistry and biology courses. It's something we can help them out with. find some words by the science writer Carl Sagan. 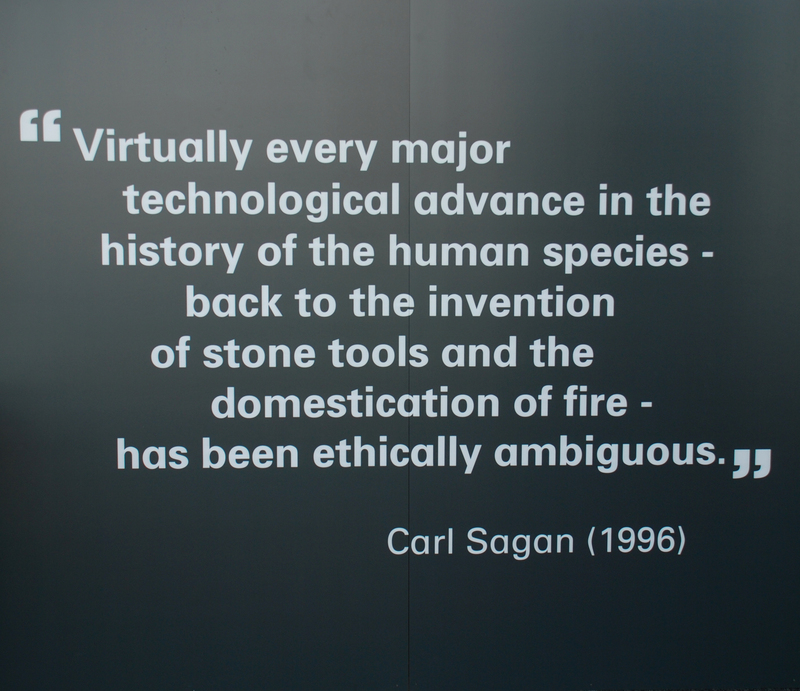 "Virtually every major technological advance in the history of the human species - back to the invention of stone tools and the domestication of fire - has been ethically ambiguous." Working in groups try to figure out a sentence in simpler words that says what you think Sagan is saying. Once you've done that you can compare your thoughts with ours. Now in groups again try to think of two examples of what Sagan is talking about besides the ones he mentions - fire and stone tools. Fire can cook food or burn down our neighbour's house. A stone axe can fell a tree or a person. What about a shared language with apes? Well that could be used to find out how they feel and what they want - or to make them do tricks for our amusement. Decisions about how new discoveries in science will be used are not normally taken by scientists. They are taken by governments and politicians. find out what the scientists and technologists are up to - the news. understand what it means - the issues. talk about whether the science, the way it is done and the way it can be used are good or bad - the ethics. Real science is about all three of these - the news, the issues and the ethics. [To teachers: Almost none of this has traditionally been part of science education. But new science curricula are being developed all over the world to interest and engage young people, to allow students to participate in science - rather than passively absorbing knowledge - and to produce scientifically well-informed 21st century citizens. So let's take a look at the issues and ethics around the science news and exhibits about great apes learning language. Just about every new discovery or invention can be used to do good things or bad things.